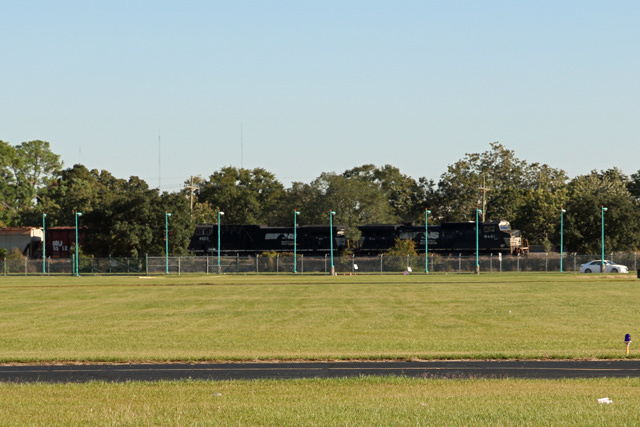 Last Saturday my friend Ron Findley and I drove up to Jackson, Louisiana to watch the steam-up scheduled for the day. 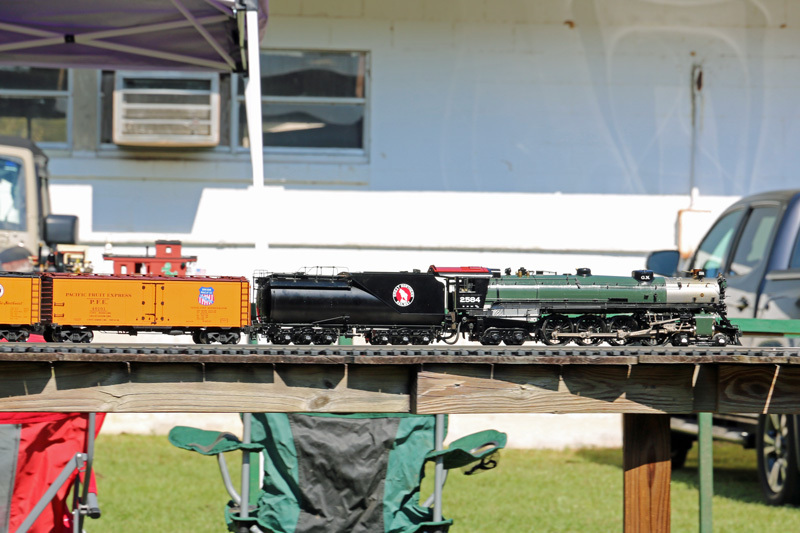 This is the home of the Greater Baton Rouge Model Railroaders, and one of the club features is a nice elevated loop for the live steam buffs in the club. This day was host to a number of folks from out of state, and we delighted in seeing several new faces at the event. Just heading out on the mainline after our arrival was this beautiful F scale D&RGW K-36 2-8-2, pulling a short passenger train over the line. An F scale (1:20.3) steamer is quite large, and the sounds are awesome! Shortly afterwards, a Great Northern class S-2 4-8-4 took to the rails, seen here hauling a freight train with several perishables in tow. She had to make speed to arrive at her destination in a timely fashion! Perhaps the most interesting thing run yesterday was this Schnabel car. It appears to be a model of the Westinghouse car, WECX 800, which I believe to be the largest Schnabel car in service. She sports 36 axles! These cars are used to transport very large and/or heavy loads. The car splits in the middle and the load is placed between the halves. In essence, the load virtually becomes a part of the car. The model was built with the aid of 3D printing, and is almost complete, with only the need for lettering and perhaps a detail or two. These are just a few of the locomotives performing during this day; quite a few others ran as well. I’ve posted photos previously of others that I’ve seen in earlier years, and a search should yield those posts if you would like to see them. 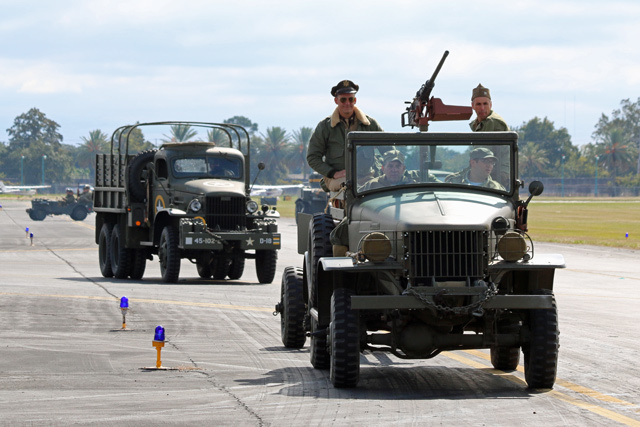 This past weekend Ron Findley and I attended the WWII Air, Sea & Land Festival down in New Orleans. This is the fourth time this event has been there (it was given a new name this year), and it is an absolutely fabulous show. 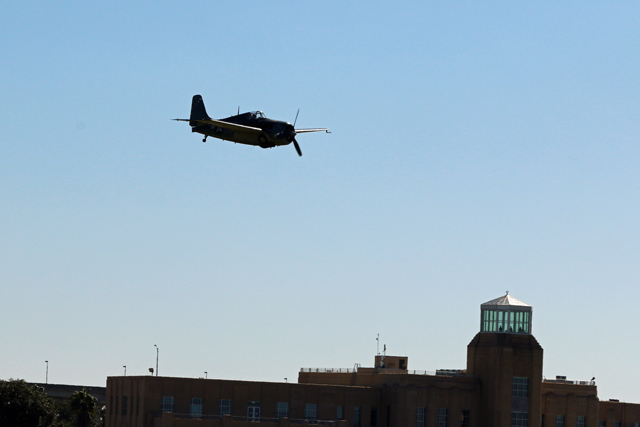 The primary forces behind the event are the Commemorative Air Force and the National WWII Museum in New Orleans. I know this is supposed to be a blog about railroading, but I confess to also being an aviation addict, at least when it pertains to military aircraft. And WWII vintage aircraft are dear to my heart. Therefore, I’ve decided to relax the “rules” to accommodate this post, and show a few highlights from this year’s show. OK, a “few” are actually 28 photos, but that was culled from the 861 images I shot during the course of the day. I wish I could post them all. Saturday morning was windy and had a heavy overcast, with a very low ceiling. Fortunately, by late morning a cold front moved into the area and pushed the clouds away. The day was chilly and very windy, with a strong north wind for the remainder of the day. But now with sunshine and an unlimited ceiling, the aircraft took flight. In years past, the flying aspect of the show was pretty much limited to take-offs and landings, with aircraft mostly used to take (paying) passengers for a short spin around town. But this year that all changed. All of the bombers and most of the fighters and trainers took to the air. 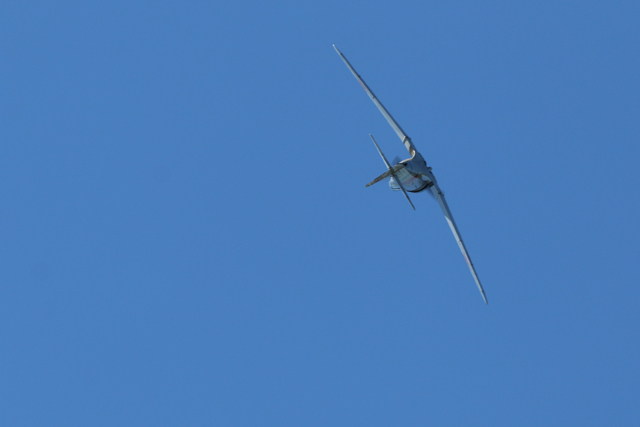 And a number of them did splendid aerobatic maneuvers to the delight of the crowds. This year’s show was hands down the best thus far! I’m already looking forward to next year. I’ll start with a few shots taken of the ground parade that was also new this year. This was basically a “pass in review” of the cars, jeeps, trucks, personnel carriers and even tanks. That was followed by various groups and organizations (some rather zany), all in good fun. 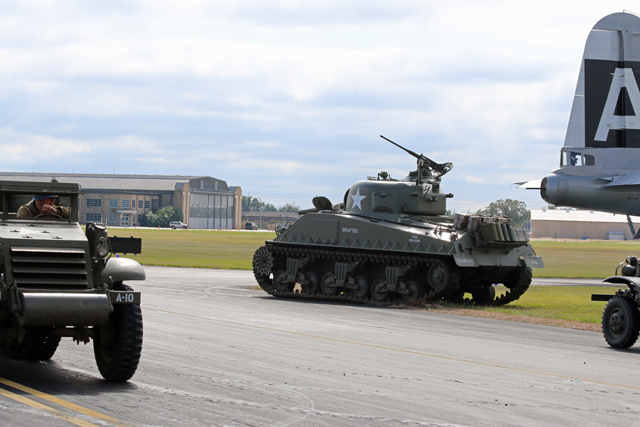 At right is an M4A3 Sherman tank as it passed a parked B-29 bomber. At left, a half-track is approaching. And here is that White M-3 half-track approaching my position. 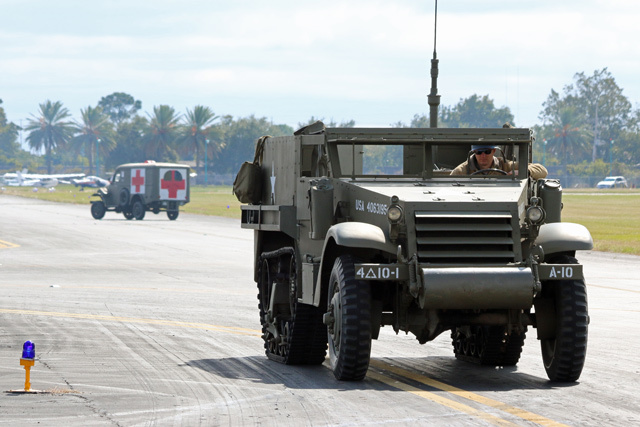 A Dodge WC-54 ambulance is seen in the distance. A 3/4 ton truck and a CCKW deuce-and-a-half follow. 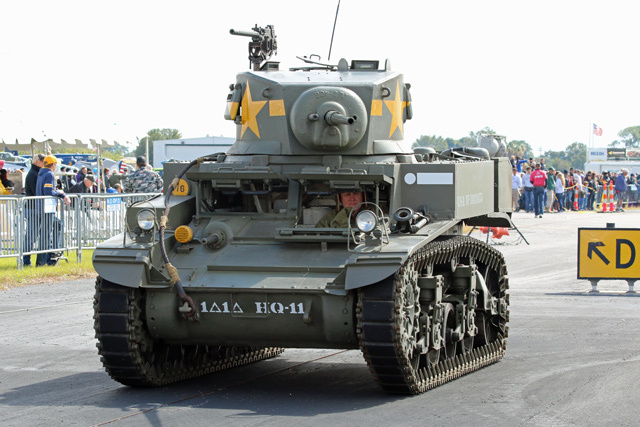 And a light M3A1 Stuart tank follows up at the rear. 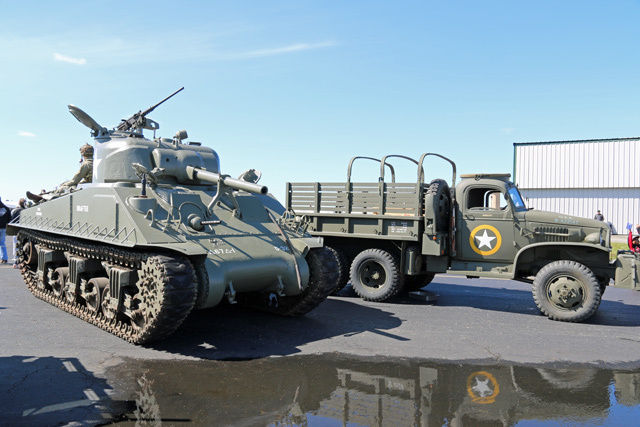 Here’s the Sherman and the deuce-and-a-half parked back in the display area. There were quite a few other vehicles that I haven’t shown . . . these were just a sampling. Let’s look at some aircraft highlights. The good news is that there was a lot of flying, and some pretty slick maneuvers going on. The bad news is that the sun was on the far side of the field. So naturally, this made photography quite difficult. Unfortunately most photos tend to be in shadows or silhouetted. But even the silhouettes are cool! So let’s get to it. 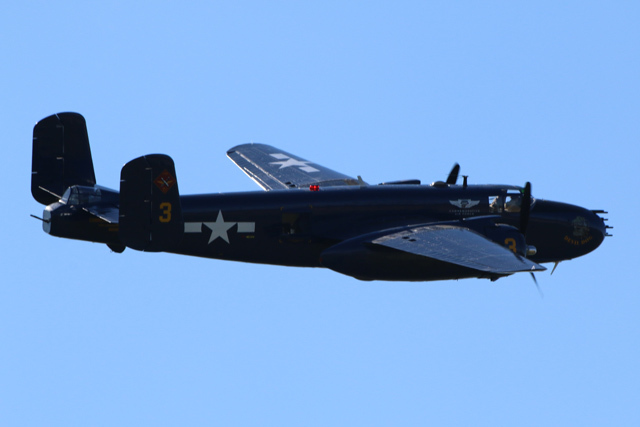 First we have a USMC PBJ, the Devil Dog, which is really a variant of a B-25 bomber. This was used for many things, but strafing was it’s specialty. Note the array of eight guns poking out of this things nose. And if that isn’t enough, there are also four .50 caliber machine guns mounted on the side of the fuselage (two on each side) just behind the pilot. Can you imagine the sheer volume of lead being rained down upon the target?! 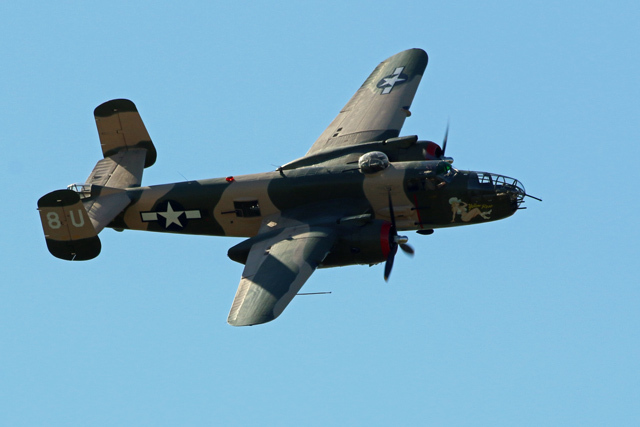 And here is the classic North American B-25J Mitchell bomber, the Yellow Rose. Apparently these large aircraft are fairly agile seeing the way these pilots were flying them, and considering how they were used during the war beyond their intended use as bombers. 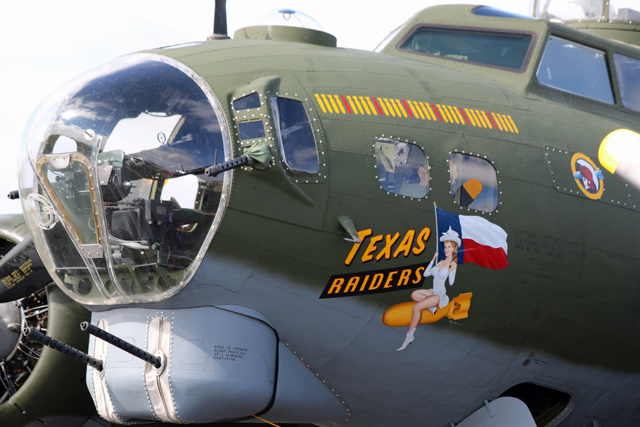 Here’s a close-up of the nose art on a Boeing B-17G Flying Fortress bomber, the Texas Raiders. She even has a bomb load inside, complete with anti-Hitler graffiti. And here she is in flight. The markings on the plane indicate it’s from the 533rd Squadron, 381st Bombardment Group of the 8th Air Force. The Boeing B-29A Superfortress, Fifi is coming in for a landing. 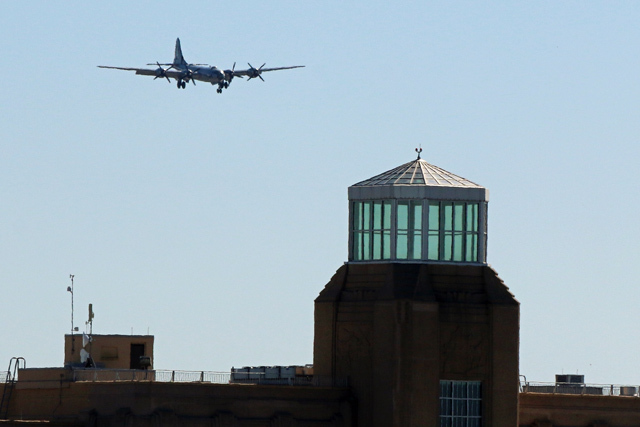 In the foreground is the former control tower of the art-deco styled terminal building at the New Orleans Lakefront Airport. Fifi is one of only two B-29 bombers still in flying condition. Here is a Curtiss-Wright P-40 Warhawk fighter. This one is in the Army Air Force livery, rather than the commonly seen Flying Tigers motif. 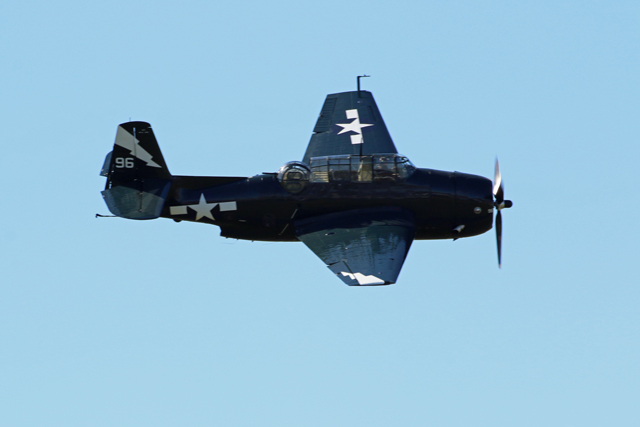 And here’s a beautifully restored TBM Avenger torpedo bomber. This airplane is surprisingly large! It has a crew of three. 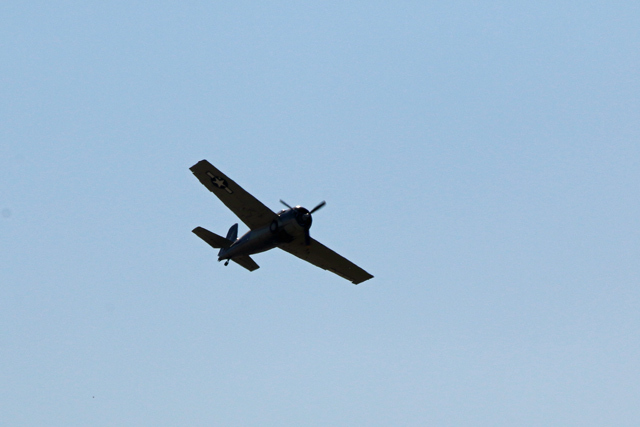 The TBM is a Grumman TBF produced by General Motors’ Eastern Aircraft Division under license. 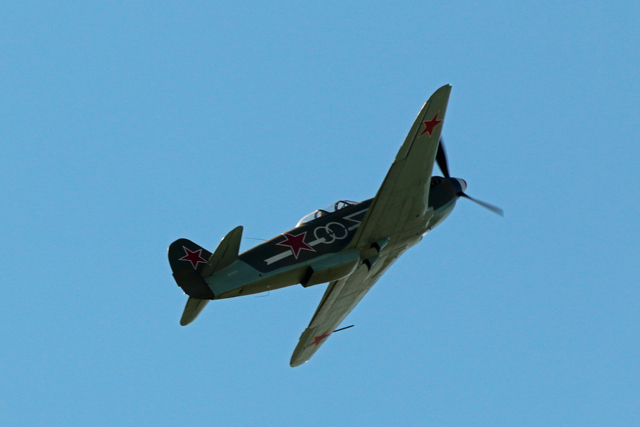 Something a little different: a Russian Yakovlev YAK-9 fighter. This thing is rather small, but appears to be fast and agile. It was the most produced Soviet fighter of all time. 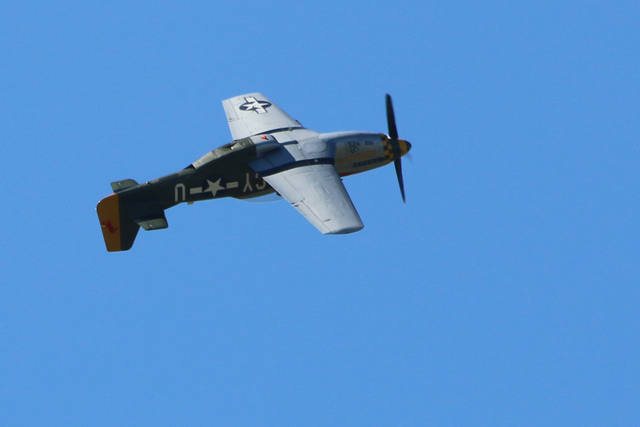 Now what would an air show be without a P-51? 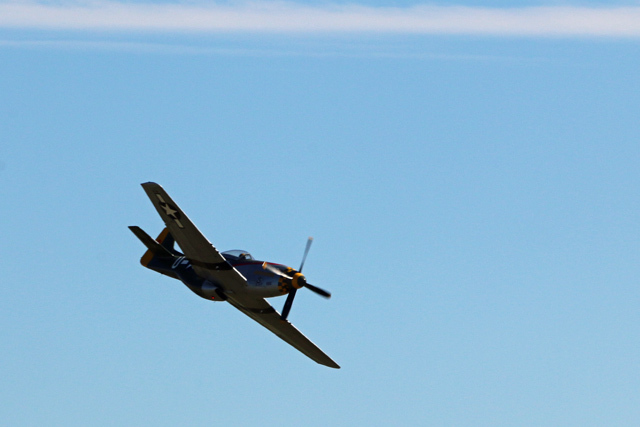 Many consider the North American P-51D Mustang to be the most beautiful aircraft produced during WWII. 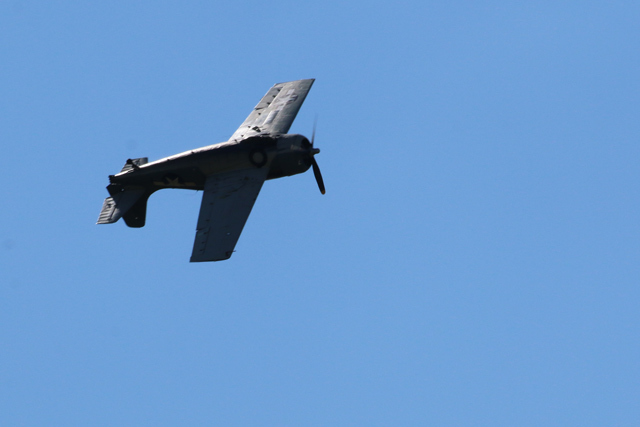 Here’s Gunfighter coming in for a strafing run. 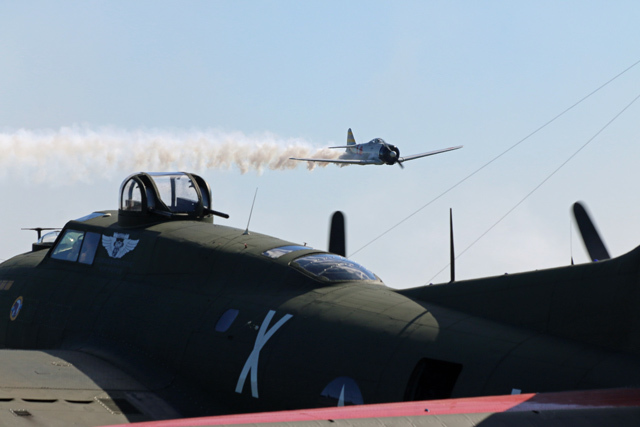 Gunfighter buzzes by the B-29 Fifi as she taxis out for a takeoff. 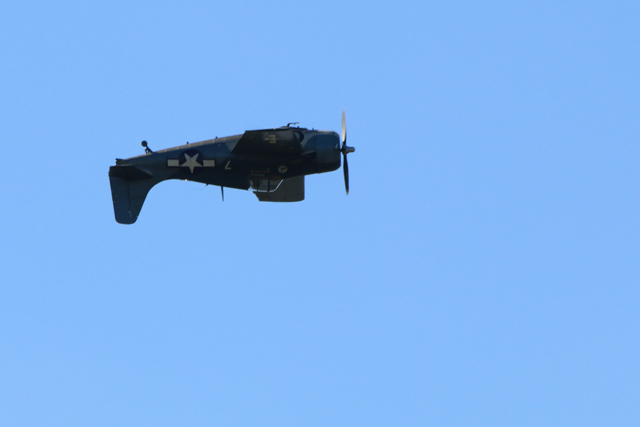 The Gunfighter put on quite a show, complete with loops, wing-overs, rolls, and more! 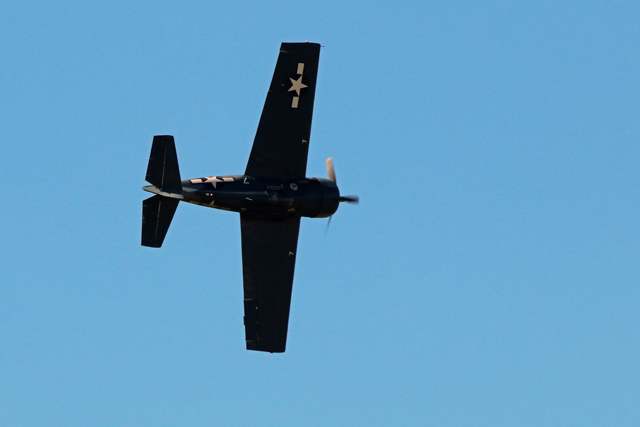 This airplane is very fast and agile, and it always impresses the crowd. Someone has sounded an alert! 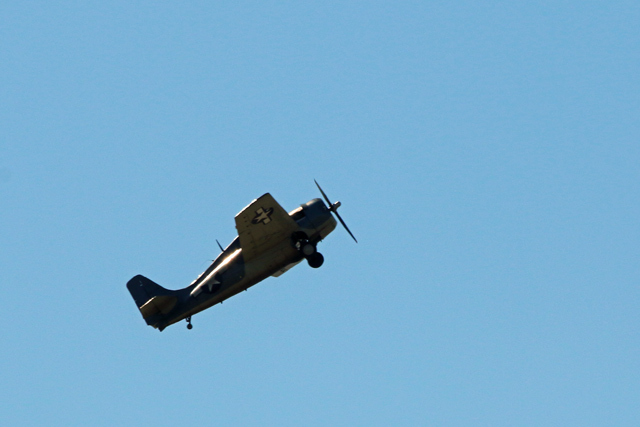 Here’s an FM-2 Wildcat springing into action. No, I didn’t tilt the camera for effect. With this airplane’s ability to launch from aircraft carriers, coupled with the stiff headwind that day, the thing literally leaped into the air within moments of the pilot opening the throttle. Grumman Aircraft was focused on the development of the new F6F fighter, so they licensed production of the F4F Wildcat to General Motors’ Eastern Aircraft Division, hence the designation of FM-1, then the FM-2. And here’s what caused the scramble, three Japanese Zeros! Looks like the one on the left has just been hit. And it looks like this Zero has been wounded as it was strafing the field where this B-17 is trying to taxi out to the runway. Well, the Wildcat is that Zero’s problem. He’s hot on his tail. I was surprised by the performance of the Wildcat. 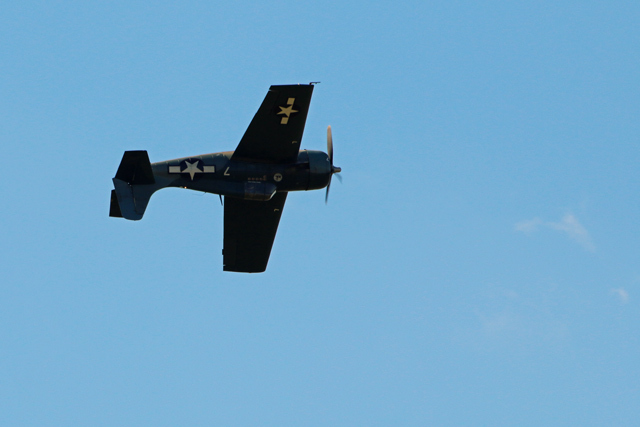 It was one of the hardest aircraft to photograph due to it’s small size, it’s speed and it’s maneuvering. With the Zero dispatched, the Wildcat can celebrate…. The third Zero is frantically trying to avoid the hail of lead about to come his way! These aircraft are Japanese Zero replicas created from AT-6 Texans. 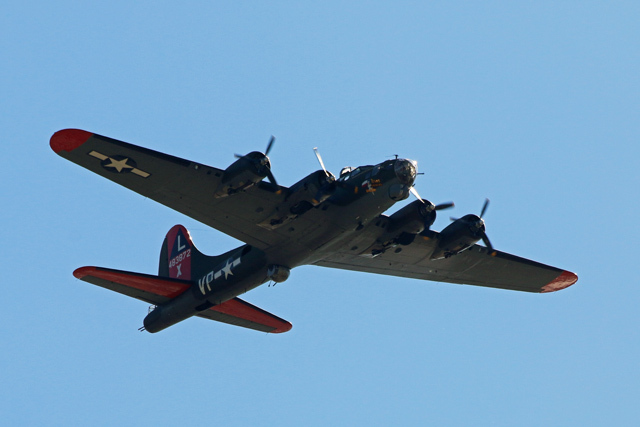 They’ve been featured in several movies and in scores of airshows. Actually, there were many more aircraft flying than what I’ve shown here. 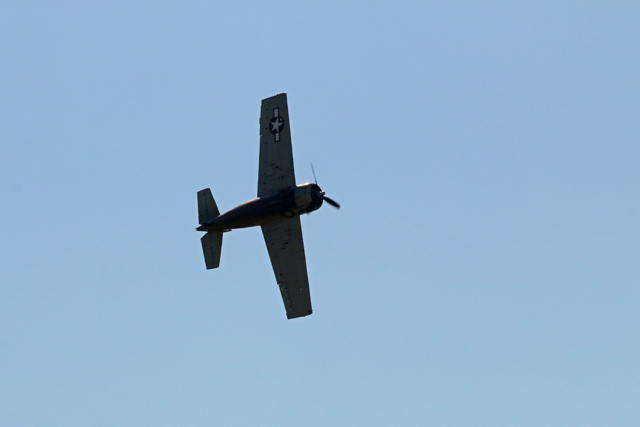 And there were a couple dozen aircraft on display that didn’t fly at all on Saturday. I wish I had room to show them all. There was even a (surprise) low-level flyover by a B-52 bomber! The title of the post indicates air, sea and land. You’ve seen the air and the land, but what about the sea? The WWII museum recently completed restoration of a Navy PT boat, which was on display in the adjacent yacht harbor. Unfortunately we just didn’t have time to make it over there to check out the boat. However, since it is local to New Orleans, we can go visit it on another day, and without the pressure of trying to see too much in one day. Indeed, the biggest problem I’ve had in viewing the displays downtown at the museum has been the overwhelming abundance of displays. It’s impossible to see everything there in reasonable detail within a single day. The NS mainline passes right by the airport, and this was one of 5 or 6 trains that passed during the afternoon. So there, I’ve managed to bring this post back to where it belongs. The 4th annual Train Day at the Library in Baton Rouge is now in the bag. Last Saturday was a gorgeous day and folks took advantage of that to attend the event. The usual fare was presented including operating layouts, slide shows, photo exhibitions, and numerous displays of models. Several railroad historical societies were represented as well. This year we had a new addition to the displays: Bill Chidester brought two Fairmont motor cars over and they were displayed at the entrance to the library. One is in operating condition and the other is his recent acquisition of a derelict which Bill plans to restore. The speeders drew plenty of attention from both adults and kids. It’s the end of the day and the motor cars have just been loaded up on Bill Chidester’s trailer for the trip back home. That’s Bill on the left, Wayne Robichaux on the right, and yours truly at center. Photo by Bob Schilling. I really have enjoyed this small gathering each year. I look forward to seeing friends there, especially those that I don’t get to see very often. And Saturday was no exception in that regard. Many thanks to Forrest Becht and all the others that made the show possible. Wayne and I, along with Bill and his wife, made our way over to a local steak house afterward. A New York strip, along with a loaded baked potato and salad, all washed down with a cold and tasty brewski, was the perfect way to cap off the day. The past month has seen somewhat sporadic progress on the layout. I confess to several distractions during this period. Three weeks ago Ron Findley and I motored down to New Orleans for the Airpower Expo at the Lakefront Airport. 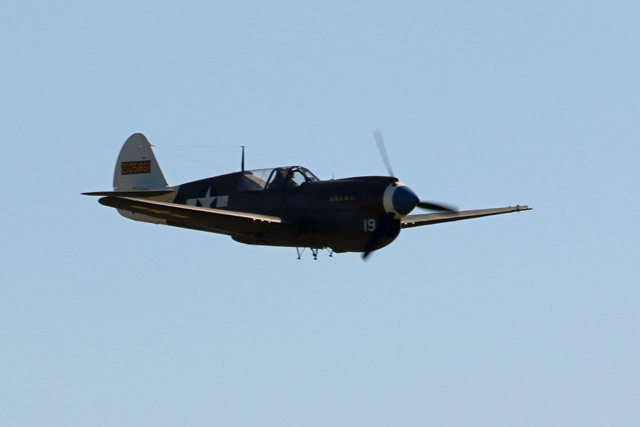 This year’s show was again quite interesting, with a nice roster of war birds in attendance. 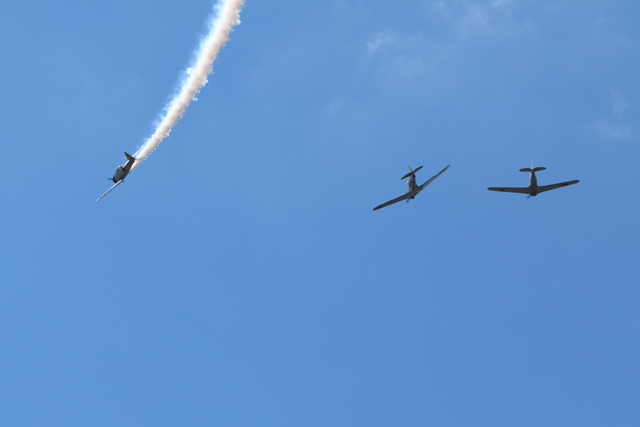 There were three bombers there (all flying): a B-29, a B-17 and a B-25. 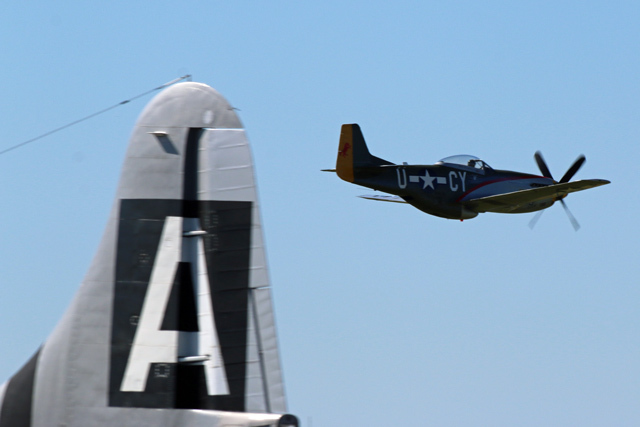 A P-51D Mustang was busy all day with flights, along with an SB2C Helldiver and a P-40 Warhawk. Also on display were an SBD Dauntless dive bomber, a P-51C Mustang in “red tail” livery, a P-39 Airacobra, a C-47, and several training aircraft of various vintages. The National WWII Museum (co-sponsor of the event) had quite a few pieces of ground equipment ranging from trucks and jeeps, to small field pieces, to a light tank. A great day with good weather and plenty of flying. 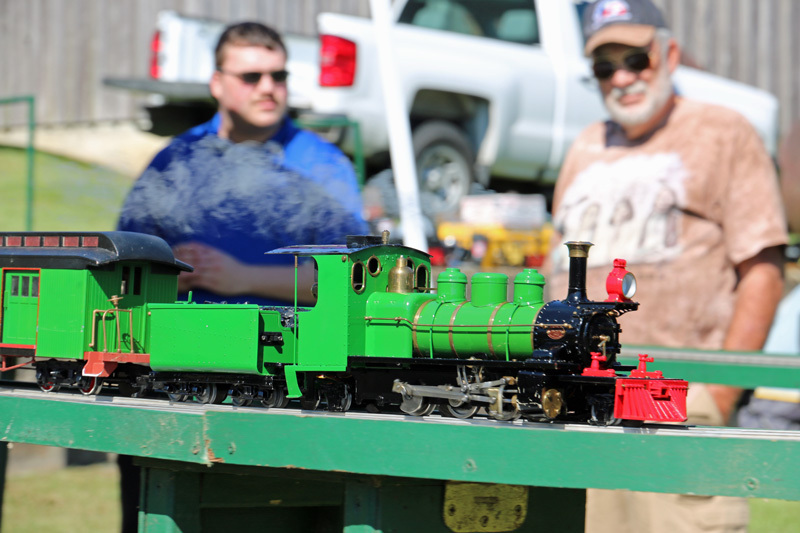 Then last weekend I headed over to Ponchatoula with Ed Dayries to take in the annual train show over there. The show is primarily aimed at the 3-rail crowd, but there was also a nice S scale layout in operation, as well as a live steam display. Vendors were offering their goods in just about all of the common scales/gauges. We capped it off with a short run up to Hammond where we happened to catch Amtrak #58, the northbound train running from New Orleans to Chicago. Progress on the layout has come in short spurts during this time. I’ve finished the mainline track through Whitcomb and the switch motors are installed. I’ve started on the passing siding and industrial spur trackage. I’ve finished all the joists on the peninsula that I wrote of last month, and I’ve cut out the basic sub-roadbed shapes for Oneida…trimming and adjustments will be made later once it’s time to plot out the track centerlines. Today saw an uptick in the production, with some excellent progress being made. Wayne Robichaux and I made a lumber run this morning after enjoying the weekly ROMEO* breakfast. After unloading the material, we proceeded to lay out and cut the plywood and Homasote sub-roadbed pieces that will be needed for the turn back loops located in the alcove west of Whitcomb. We completed both the Louisiana Central and the Spencer Lumber Company’s sub-roadbed loops. I’ll probably start making risers for all of this tomorrow. I received the 72′ bridge that I needed for the overpass at Whitcomb but it still sits on the workbench awaiting assembly. I’m going to have to start focusing on specific tasks for the remainder of the year. There are many events (those distractions) between now and late January that I’ll likely participate in. But that’s okay, because for me, that’s part of what I enjoy about this hobby. As I age I’m finding the social aspects are becoming more and more important. I can hardly wait for each event, whether it be a train show, an open house, or an NRHS banquet…I’m ready for it! And of course, with the holidays coming up, I’ll also be enjoying good time with family. It’s a great time of year! But fear not, the Louisiana Central will continue to progress. Ultimately, I can hardly wait for the day when trains are operational. It’s been awhile since I’ve posted any updates, so I thought maybe I should peck out a few lines about what’s been going on. 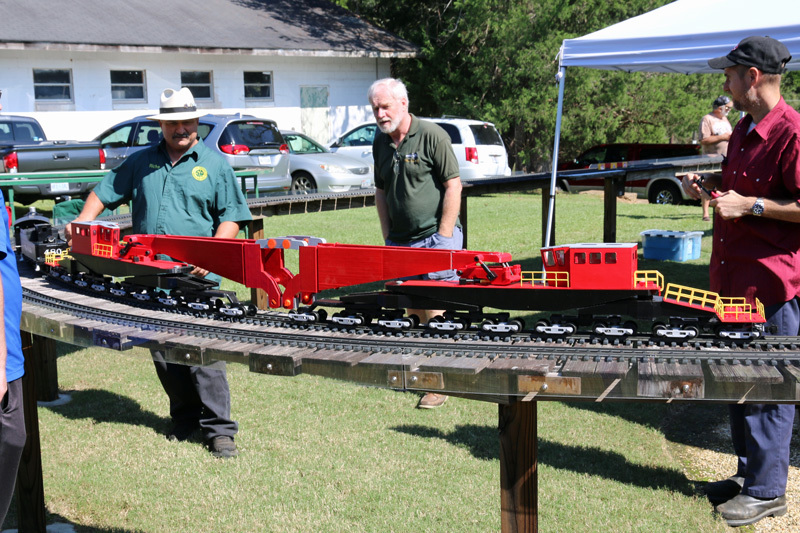 Last Saturday, Ron Findley and I attended the Greater Baton Rouge Model Railroaders’ annual open house up in Jackson, LA. It was a beautiful day and there was a record turnout in attendance. The highlight of my visit was seeing a gorgeous U.P. Challenger running on their live steam loop. What a sight! Progress in Whitcomb has been a bit slow, but still steady. The sub-roadbed and roadbed work through the town is nearly complete, and reaches out to the edge of the (future) Louisiana Central bridge just beyond the west end. Only some feathering of the vertical roadbed transitions needs to be done. The Spencer sub-roadbed has been extended through the S-curve that passes below the bridge and is headed toward the alcove in the corner of the room. Track on both lines has been extended a bit further and should be completed in this area fairly soon. The weather outside has been very dry and a bit cooler, so I recently decided to drag the saw outside. I cut the wooden joists that would be needed for the second peninsula (which is also the fifth and last major area of benchwork). Last Monday I installed the joists along much of the peninsula, and today I started laying out the joists around the orb at the end. I should wrap that up tomorrow. At that point, the peninsula will be ready for the sub-roadbed. A few weeks ago I completed the vertical roadbed transition at Willis from the mainline down the yard ladder. It turned out quite nicely and it makes me want to rip out other transitions I’ve done and replace them with these long, very slightly tapered ones. But I won’t….at least, not for now. It’s all I can do to get this layout up and running without ripping things out for re-dos, especially when they’re cosmetic in nature. A month ago I said I’d be posting a few photos shortly. I have been waiting for the work at Whitcomb to appear a bit more finished. It’s taking longer than I expected, but I should be there soon. As I’ve quipped in my last couple posts, “I’m pleased with the progress being made”. 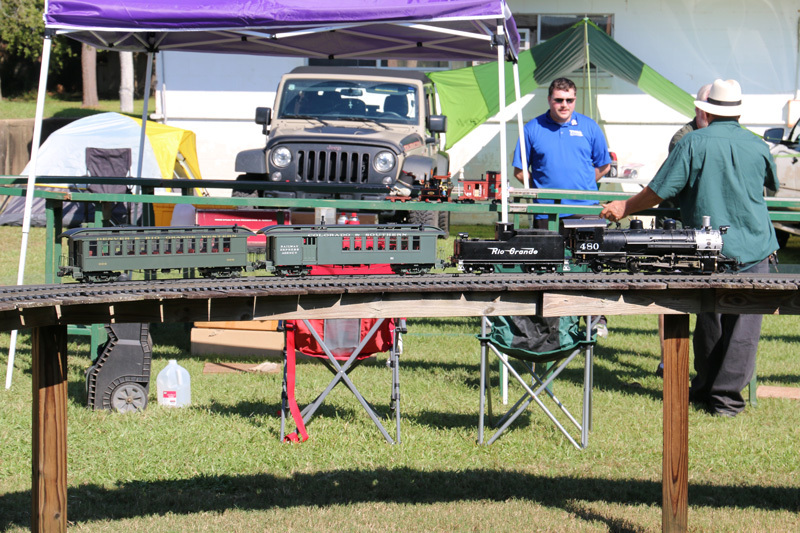 First, an announcement: In less than a month The Greater Baton Rouge Model Railroaders will be hosting their annual open house up in Jackson, Louisiana. Saturday, October 10th is the date, and the entire facility will be open for display. They will have layouts in operation ranging from N scale, all the way up to G (and Fn3) scale live steam. Lunch is provided and it’s always a great way to spend several hours. Make plans to drive up there. I’ll follow up with another post in a few weeks with further details and directions. This past weekend was productive on the Louisiana Central. I converted and installed another code 70 switch at the bottom of the Spencer logging operation switchback. That completes both the Camp 6 and double switchback trackage. I also advanced the trackage of both the Spencer and the Louisiana Central mainlines toward Whitcomb, getting about 25 feet of track down. By next weekend the track should reach the end of the sub-roadbed presently installed. I’ve also started a bit of roadbed work over in Willis. A few weeks ago Wayne and I cut some long tapered pieces of roadbed from some 2×4 lumber for use as transitions from the cork roadbed down to the Homasote table top. These will be needed in several places around the layout. I installed the first of those vertical transitions at the beginning of the yard ladder in Willis. This will enable me to complete the passing siding and to start laying the yard trackage. In a few weeks I’ll be pushing the sub-roadbed beyond Whitcomb and into the alcove, where the L.C. and Spencer mainlines will be making some hairpin curves and then heading out onto the second peninsula where Oneida is located. If you study the trackplan, you’ll see that the L.C. mainline crosses over the Spencer mainline just west of Whitcomb. I had planned to use a Micro Engineering 50′ plate girder bridge there. I opened the package recently to study and perhaps begin assembly of the bridge when it dawned on me that the bridge would be too short for the planned installation. The problem is that the angle of the crossing is about 35 degrees and I hadn’t factored in the space that the bridge abutments would occupy. Uh-oh . . . back to the drawing board. I discovered that Central Valley makes the same bridge in a 72′ length. That should work nicely, so I’ve ordered one and it should arrive within a few days. Whew, dodged another bullet! As a side note, the Louisiana Central mainline has finally pushed past the halfway point. It is way behind schedule, however I’m now making significant progress in that area and am optimistic that the pace will continue as it is presently. More photos will follow in the near future. Yesterday Ron Findley and I joined a couple friends from Covington for a get-together at Tom Davidson’s home over in Hammond. 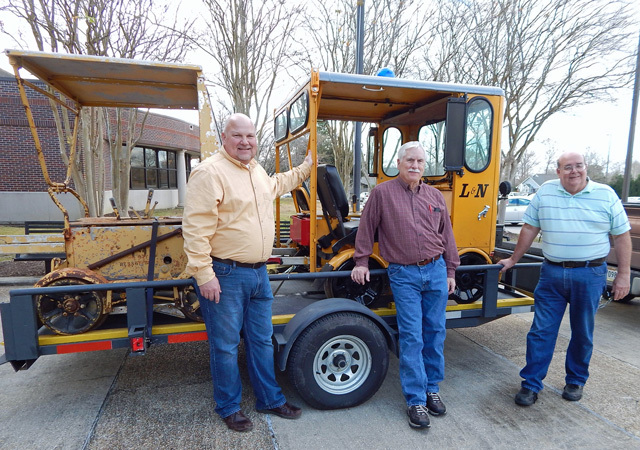 As many of you already know, Tom is a vast sea of knowledge about things railroad in southeastern Louisiana and southern Mississippi, especially when it comes to the Illinois Central. Tom did a nice presentation on the railroad history in the greater Hammond area. Of particular interest was the information presented regarding the strawberry shipments made from what was once known as “The Strawberry Capital of the World”. Afterwards we had planned to shoot photos of several small industries and businesses around Hammond, but unfortunately the rains commenced. Ron and I hung around for several hours, but it eventually sank in that this was not just a thundershower. We relented and headed home. We’ll simply return on a sunny day in the near future to complete our mission. A few weeks ago I mentioned that I had started constructing a few easy car kits. I’ve continued on that and now have a nice train full of new rolling stock added to the active roster. I’m really enjoying this and I plan to continue assembling at least a few kits each month now. As stated earlier, I won’t be detailing or weathering any of these cars initially . . . that can come later once the layout is operational. However these cars are equipped with Kadee couplers and metal wheelsets. Everything has been checked, adjusted and lubed so that these cars are ready for service. I’ve also done a little more work on the assembly of the road bridge that I also mentioned earlier. I’m assembling it in place so that it hopefully will fit the spot well when scenery work is started. I’ll post a photo in the future once it’s completed and painted. A few weeks ago I posted an update of layout construction progress and I mentioned several activities scheduled for this month. So, starting with the first of those scheduled activities, I attended the (3rd annual) Train Day at the Library in Baton Rouge. This years show surpassed last years (which had surpassed the first year). Forrest Becht and the folks who are involved in planning and hosting the show are really listening to the feedback provided by the visitors and have made the appropriate changes to reflect that. As a result, (in my opinion) the show has enjoyed considerable improvement in the few short years of its existence. Now this isn’t a large show, but rather a small gathering at a local library. There is a large and very nice photo exhibition of railroad subjects, tables and cases of models are displayed, and several local and regional organizations have a presence with plenty of hand-out literature. There are on-going slide shows throughout the day, and several small operating train layouts (three rail and some N scale). It’s fun and it’s free. Can’t beat that. Next week Ron Findley and I are heading over to Hattiesburg, Mississippi for the annual banquet of the Mississippi Great Southern Chapter of the NRHS. Their banquet is always well attended, with lots of displays, sales tables, a good speaker and plenty of great food. I’m looking forward to that. Layout activity: I’ve completed the refurbishing and wiring up of 25 Tortoise switch motors and have even installed the first one. I need to install 18 more to get all the switches presently installed operational. I also completed the hard-wired aspects of my cab bus (throttle bus). I ended up relocating the DCC command station to the middle booster location since this was electrically central to the layout. This has reduced my longest cab bus run by nearly half. As I add fascia to the layout, along with throttle plug-in points, I will only have to daisy-chain from point to point using pre-made data cables…nice and clean. I should be getting back to benchwork and trackage this spring. I haven’t done any of that since last October and I’m anxious to get back to it. I haven’t added any new photos to the main website since early January since all I’ve been doing has either been done on the workbench or beneath the layout. However the photos on the site do show the latest in the benchwork progression. If you’re interested in coming by for a visit, just drop a line and we’ll set it up.